Charting the travails of two out-of-work actors in the dying days of the 1960s, British film comedy Withnail and I has staggered to its 30th birthday. Star Richard E Grant looks back at its filming and considers whether anyone else could have tackled the role that put him on the road to Hollywood. Chin chin! Camden Town. Two sleep-deprived thespians wallow in filth, battling drug-induced paranoia, a worrying lack of booze and stalled careers. What follows - an ill-fated jaunt "to the country" and run-ins with an assortment of misfits and malcontents - would marry with caustic dialogue to produce an oft-quoted classic. 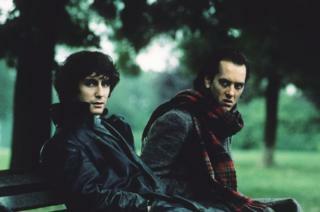 Largely unnoticed on its release in April 1987, standout performances by Grant as the acid-tongued Withnail and Paul McGann as the more introspective I helped the film gradually gather a dedicated following. No less memorable was its supporting cast of colourful characters, among them the love-struck Uncle Monty (Richard Griffiths), drug-dealer Danny (Ralph Brown) and poacher Jake (Michael Elphick). Initially created as a semi-autobiographical novel by Bruce Robinson more than a decade and a half earlier, the writer-turned-director would largely use his one-time flatmate Vivian MacKerrell as the inspiration for the scabrous Withnail, while I - identified as Marwood in the script - was a version of Robinson himself. It was, as he has outlined, "a tale of English hopelessness" and threw a spotlight on his "appalling lifestyle" as he struggled to find work after leaving London's Central School of Speech and Drama. With each set-piece so perfectly penned, the stale cigarette smoke and alcohol fumes almost seeped through the screen. But while the story may have been loaded with laughs, Robinson demanded his dialogue was delivered with a straight face. "Bruce was very exacting and did not brook any improvisation or word substitutions," says Grant, who himself had been without work for nine months and become increasingly beset by nagging doubts about his chosen career, having emigrated from Swaziland to Britain at the turn of the 80s. "He was also adamant that as there were no jokes or punchlines, it had to be played with deadly seriousness. "The script was so accurate in expressing the frustrations of being an out-of-work actor that as soon as Paul and I played everything 'for real', Bruce was very open and accommodating. "That experience [of being unemployed] proved invaluable. Withnail is so staggeringly self-obsessed and entitled, which anyone who has been to drama school will be all too familiar with!" Auditioning for the part would almost mirror the character's woes, as Grant competed against a gaggle of better-known names in a casting merry-go-round as dizzying as the concoction of drink and drugs downed throughout the film. Daniel Day-Lewis had turned down the role and other leading contenders included Bill Nighy and Ed Tudor-Pole. It was not much easier for McGann, with the role of Marwood offered to Michael Maloney. Having stepped into his shoes, his strong Liverpudlian accent promptly saw him sacked before an equally swift reinstatement. So what was it that Robinson eventually identified in the duo? "Finding a contrasting pair of actors made the audition process protracted," Grant recalls, "as Bruce was very determined to secure two people who looked and sounded like Vivian and himself. "Paul is incredibly handsome and had the quality of 'an innocent abroad', which Bruce was after." While it may seem almost inconceivable for fans to imagine anyone else in the role of Withnail, Grant modestly disagrees. "I absolutely believe that all those illustrious names could have essayed the role, as it is so brilliantly well written. "Bruce writes stage directions with the same exactitude as his dialogue - hugely entertaining, mordant, witty, and conveying the precise mood so that you simultaneously 'see' and 'feel' what the scene is about." Indeed so expertly crafted was Robinson's dialogue, fans delight in reciting the characters' one-liners and stinging rebukes - and sometimes in the most unexpected of places. "[Some years later] I was filming in the Australian outback beside a dirt road in the middle of nowhere," says Grant. "The only car that drove past all day was a battered yellow 1959 Ford Anglia - my dreaded primary school maths teacher drove one - and the driver leant out of his window and yelled 'scrubbers!' at me - to the bewilderment of the film crew." Shooting got under way in August 1986, but, like the pair's rain-lashed on-screen drive from London to the Lakes, the film's journey to the cinema screen was tortuous. A modest million-pound budget would come from Beatles legend George Harrison's Handmade Films and a New York businessman. Decamping to Cumbria's Wet Sleddale to begin work at isolated cottage "Crow Crag" (the real-life Sleddale Hall, near Shap), interference from its backers threatened to derail production, causing Robinson to issue a "back me or sack me" ultimatum. For Grant, that period of time was difficult for an altogether more tragic reason as he and his wife, Joan, grieved the loss of their daughter Tiffany, born prematurely at seven months and pronounced dead within a few minutes. "She is the size of a little bird," he recalled in his book With Nails: The Film Diaries of Richard E Grant. "She is warm but dead. And perfect. Ten toes, ten fingers. Eyes, mouth, all. Broken. No breath. "Our hearts are broken and will we ever cease weeping." The film would have its own sense of sadness and loss as McGann's I packs his bags having landed the lead role in a Manchester-based play - leaving the desperate Withnail railing in despair with only a bottle of Uncle Monty's wine and the Regent's Park wolves for company. Just as eloquently it would sum up the end of the 60s dream, replaced by commercialism and cynicism with the selling of "hippy wigs in Woolworths". Although Withnail and I failed to make a commercial splash upon its release, McGann would establish a solid stage and screen career, while Grant had Hollywood hot-shots Robert Altman, Francis Ford Coppola and Martin Scorsese all come calling. He has hardly stopped working since. It is, he admits, "some irony… playing an unemployed actor opened every subsequent career door I've walked through". Robinson would have more mixed fortunes. Follow-up How to Get Ahead in Advertising, also starring Grant, was an altogether more patchy affair while Jennifer 8 and The Rum Diary also met with criticism. Thirty years on, though, Withnail and I's popularity shows no sign of waning and a series of screenings are being staged by fans across the country throughout the coming months - with Sleddale Hall itself among the venues in July. So just what does the now 59-year-old Grant believe lies at the heart of its enduring appeal, and does he ever feel trapped by the role which, for many, defines his career? "The film is so accurate about Bruce's experience of being an unemployed actor at the end of the 60s, encompassing his breadline, booze and drugged desolation, and being friends with the coruscating and charismatic MacKerrell, that it is indelibly authentic. "His portrayal of a symbiotic male friendship is the core of the story, and its disintegration is painful and poetic. "If I had only been offered 'alcoholic actor' roles I might have something to complain about, but that never happened. Playing someone so extreme has meant I've been cast in roles that demand a certain level of intensity or mania, which I've hugely enjoyed. "I'm genuinely amazed that a film made so long ago, which initially met with such a lukewarm response, has accrued the status and cult following it has done. "For that, I am eternally grateful."